Satellite virus: The virus does not encode for a capsid and needs a helper virus for encapsidation and aphid transmission. Infection requires host cell to be co-infected with a Luteoviridae. 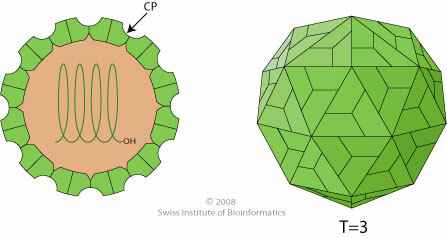 Non-enveloped, T=3 icosahedral particles of 25-30 nm diameter, with 180 copies of the capsid protein (CP). Monopartite, linear, ssRNA(+) genome. The genomic RNAs is not capped in 5', not polyadenylated in 3'. Genomic RNAs serve as messenger RNA. Translation is initiated by an internal ribosome entry site (IRES) at the 5’end. Subgenomic RNAs may be synthesized during replication. A ribosomal frameshifting induces the translation of the RNA-dependent-RNA polymerase. In case of Luteoviridae co-infection, the viral genome can be encapsidated by helper virus capsid proteins. If Luteoviridae helper virus is absent, the viral genome forms filamentous ribonucleoproteins thanks to the interaction between ORF3 protein and fibrillarin. Viral movement protein probably mediates virion cell-to-cell transfer. Ribonucleoproteins perform long-distance movement leading to systemic infection. ETYMOLOGY Umbra: From Latin, shadow.